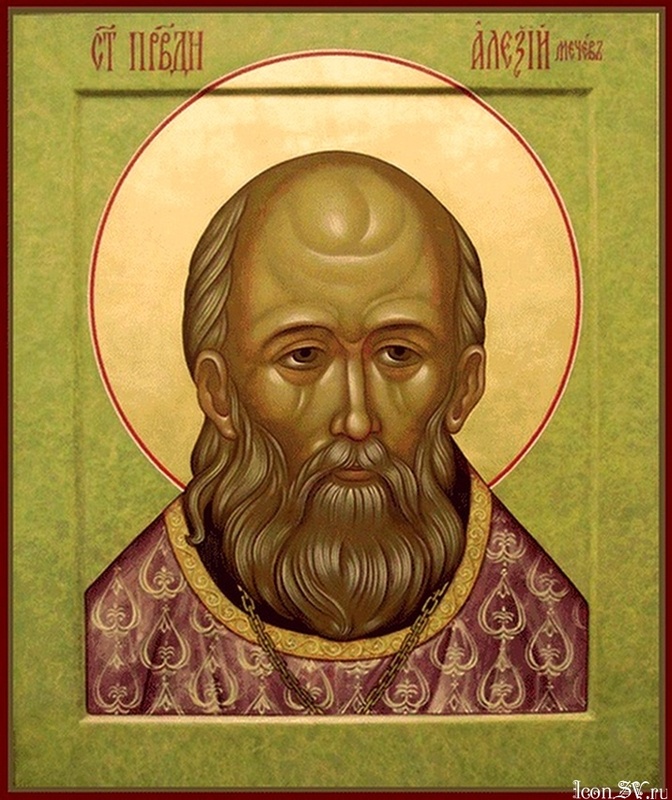 As a parish priest, I find tremendous inspiration in reading the Lives of Saints who were priests, especially those who were married, parish pastors such as St. John of Kronstadt or St. Dmitri Klepinin. (see our Diocesan website: acrod.org Orthodox Reading Room: Lives of the Saints) Glorified as a saint of our Church in the year 2000 was St. Alexis Mechev a parish priest in Moscow who is an example of faithfulness in pastoral work and holiness for all priests today. Whenever a younger priest approached him about difficulties in establishing parish life he would share this story and offer the simple advice: Pray! Live for others and you yourself will be saved. To be with people, to live their life, rejoice in their joys, sorrow over their misfortunes…herein lies the meaning and way of life for a Christian, and especially for a pastor. From his hours of personal prayer, the liturgical life of the Church, and fasting, Father Alexis was blessed with the spiritual gift of clairvoyance, that is, the ability to read the hearts of those who came to him, to understand their needs and struggles. Apart from this gift of the Holy Spirit there are no outstanding deeds associated with his ministry, no dramatic stories of healings, no tortures or martyrdom, no grand building of churches or a monasteries. Father Alexis was a parish priest who remained faithful at his post of daily prayer and ministered to the people entrusted to his care. Father Alexis even taught others: Don’t want to realize big projects, but do that to which the Lord calls you. His concern was not for “success” in the eyes of the world: a large parish, dean of a Moscow cathedral, a comfortable lifestyle but his concern was to be faithful in the place where the Lord had placed him. In the words of a holy woman: God has not called us to be successful but faithful. Father Alexis died on June 22, 1923 and his funeral revealed that he was not only a faithful priest but that his faithfulness was recognized by others. Tens of thousands of people gathered for his funeral served by eighty clergy. Paschal hymns were sung along the route to the cemetery. Even the saintly Patriarch Tikhon, recently released from house arrest by the Communists, served a Panachida at the cemetery. Father Alexis’ body was found to be incorrupt in 1934 and in August, 2000 he was added to the calendar of Saints by the Synod of Bishops of the Orthodox Church of Russia. So many of us priests become discouraged, we experience much of what St. Alexis experienced: often serving in an empty or near empty church especially on a weekday. Many of us secretly yearn for a promotion to bigger and better things. This yearning is not necessarily sinful, we priests truly desire to serve the Lord and to be used by Him. The life of Father Alexis is a lesson in faithfulness. He served for eight years in an empty church but he remained faithful in prayer. Whether he was joined by 100 of his parishioners or no one, he was at his post, standing before the Holy Altar daily. He remained in the same parish church his entire priestly career never experiencing a “promotion” or even the episcopacy but he remained faithful. He was not known as a miracle worker, did not erect magnificent churches, never served as a missionary to foreign lands, but he was a faithful pastor, a father to the people entrusted to his care.